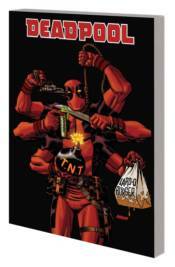 Deadpool is desperate to end it all, but his healing factor makes dying a near-impossibility. When Wade finds the one thing in the world that can kill him - a serum that permanently disables his regenerative abilities - he just might get his wish. But his newfound ability to die makes Deadpool feel more alive than ever, and his sudden lust for life gets him in hot water with everyone he crosses - including crime bosses, super villains, his fellow mercenaries and even a dual-Beretta-wielding monkey! Can the Merc with a Mouth escape his pursuers and his pattern of insanity-fueled self-destruction, and finally live life to the fullest? Guest-starring the Uncanny X-Force, Daken, Kingpin, the Intelligencia and more - all of whom want to ensure that Deadpool finally meets his maker! Collecting DEADPOOL (2008) #50-63.